Notes from the Crimea: Was there a battle plan for the Alma? Was there a battle plan for the Alma? The answer, undoubtedly is yes. The overwhelming body of evidence from French sources, from Le Marechal Saint-Arnaud down to a Capitaine of Infantry, suggests that indeed there was a battle plan for the Alma, a plan which, according to Le General Bosquet, would have been effectively a re-play of Austerlitz. The traditional English language historiography of the Alma, which originates with the report of W H Russell ot The Times and Kinglake's vitriolic defence of Raglan suggests that the Allies fought their own separate battle, which was, of course, won by the English despite the French. But this is not true. Following the skirmish on the River Bulganek on 19 September, Marechal de Saint Arnaud held a Conference which was attended by his Generals of Division, of Brigade as well as L'Amiral Hamelin and his Etat Major - this was a combined force action, the fleet shadowing the French movement onshore and providing a mobile artillery reserve. The plan of the Battle of the Alma is this. The fleet should protect… the right; the General Bosquet will attack the enemy to turn his flank, who is far from expecting a surprise such as this. The three other divisions will attack the centre, whilst the English, on the extreme left, will make a flanking movement to turn the enemy and converge, to fully envelope the enemy, who will be engaged in the centre on a cross-fire… The arc of the circle which is to be executed by the English is very long but that also describes the Division of Bosquet… the Cavalry will be provided by the English. 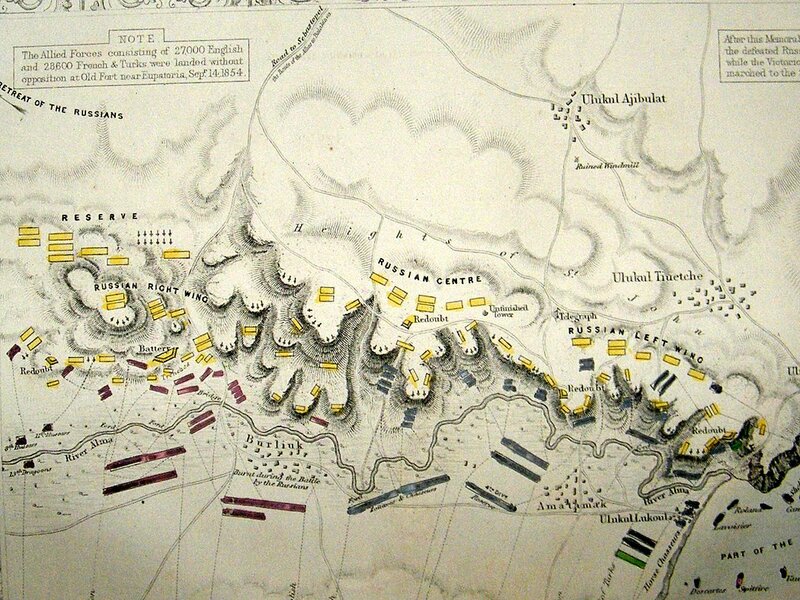 The plan of the battle for the following day was well concieved. Relying on our superiority of numbers, we would profit from this and turn the enemy. The Division of General Bosquet, along with the Turkish Division, were to cross the Alma by the sea, scale the cliffs which dominate the river and debouche onto the plateau, attacking and putting into disorder the Russian left flank, At the same time Bosquet arrives on the heights, the Division of Prince Napoleon and the majority will cross the river and attack in front...The Marechal proposed to Lord Raglan that the English would make the same movement but by inversion, The Division of Bosquet was to leave camp at 5 o'clock in the morning, the other troops at 7 o'clock. No one raised any objectoions to this plan, which seemed rational. The left of these positions was to be turned by the 2nd Division and part of the Turks, the centre was to directly attacked by the 1st and 3rd Divisions, and, finally, the right of the Russians had to fight the English. A seven o’clock in the evening, the Marshal Saint-Arnaud communicated to his Generals of Division his plans for the battle on the morrow. The English army was to occupy the left, and would march, at the point of the day, crossing the Alma behind the position defended by the Russians, and, there established the plateau, attack their right flank and their means of resistance that they have accumulated. At the same time, the General Bosquet, who also had under his command the Turkish Division, commanded by the General Yusuf, leave their camp, and, along the sea coast, climb the plateau by the escarpments which terminate by the coast. Overwhelmed by the Allies in this double manoeuvre, the Russians would only be able to show a feeble resistance to the frontal attack to which the remainder of the French army was committed. So why wasn't it put into action? Our anonymous Staff Officer suggests that the plan failed to work because of "the inability of the English divisions to manoeuvre which was relatively simple in our plan of the battle." and that Saint-Arnaud had mistakenly under-estimated the strength of the Russians. But this interpretation does not explain why Lord Raglan simply attacked the Russians in a frontal assault, attaking the artillery redoubts whiuch Saint-Arnaud's plan was at such pains to avoiding attacking in front. The answer comes from Colonel Trochu - the Senior ADC to Saint-Arnaud and also Le General Canrobert. Trochu in a very frank letter to the state-newspaper La Moniteur states how at 6am he repeatedly sent Staff Riders to English lines to enquire why they were not moving. The consistent reply from Raglan was that " we are not ready." Finallt, in a fit of pique, Trochu himself galloped over to Lord Raglan who told him th at the British would not be ready to move for a further two hours. Trochu swore at the "damned, perfidious English" and galloped back to Saint Arnaud. A similar story is relayed by Genreral le Comte Edouard de Martimprey who was the French Chief of Staff (Chef d'Etat Major). That, once again on the campaign "The English were not ready." Le General Canbrobert goes into greater detail, He says that as soon as the Conference with Le Marechal and his senior officers was finished, Trochu galloped over to Lord Raglan, about 7pm where he informed him of the battle plan both in writing and verbally. Trochu, however did not return until "very late in the evening" toward 11pm. Trochu reported to General Martimprey that Lord Raglan had listend to everything he [Trochu] had said, gave every indication of agreeing with the written and verbal instructions and that the plan as going to go ahead. It was too late by then, however, to change it as orders had been issued to the Army and to the Fleet. Canrobert writes "At five o'clock in the morning Bosquet commenced his movement: the columns of manoevre, the bayonets flashing in the sun, snaking along the sea coast. At seven o'clock the other divisions formed in line of closed columns by battalion; the artillery deployed in the intervals between each brigade, with the general reserve in the second line, The Marechal passed in front of troops, to direct the left, where the English army should have been deploying. Annoyed by the constant inaction, he sent Le Colonel Renson to General Bosquet to helt his movement. The Colonel Trochu was sent to Lord Raglan to find out the reason for the delay." Neither General Canrobert or Prince Napoleon could understand the delay. Prince Napoleon went to find General Sir De Lacy Evans: he found him "in his tent, the only one in the division". Prince Napoleon announced to Evans "why had you not attended to your orders. our troops should be ready you have had notice to take arms and your troops should be ready..." Canrobert and the Prince explained to Evans the plan for the British to turn the Russian right flank. Saint-Arnaud despatched the redoubtable Trochu to Lord Raglan to enquire why he hadnt beung his flank movement. Trochu reported that the plain of the evening had been recounted to Lord Raglan in writing and explained verbally all of its details but it was only that morning that Raglan had raised any problems: according to Trochu, Raglan believed it was safe for the French to turn the Russian left because they were protected on both flanks; it was not safe for the British to turn the Russian right via a flank march because the Britisih left flank was open and Raglan did not know whether there was another Russian force which could fall on his left. A sensible observation, but one surely which should have been raised the following day! "In Brief," said Trochu "The plan which had been devided by the French Etat Major had in effect been rejected by the English on the day of the battle."